They're $100 and come with antenna and antenna cable included. They come preset to 115200 baud and you can easily set it to whatever baud rate you'd like over UART. Let me know of any cool projects you guys make! DroneCells are making their way to the proper distributors, and I've been working hard on software and documentation. Here are some video tutorials showing how easy it is to utilize the DroneCell. The DroneCell is a cell phone for your robotics/electronics/minicomputer/anything project. You can make and receive phone calls, send and receive text messages, communicate over the Internet, and do nearly everything else your regular phone can do. 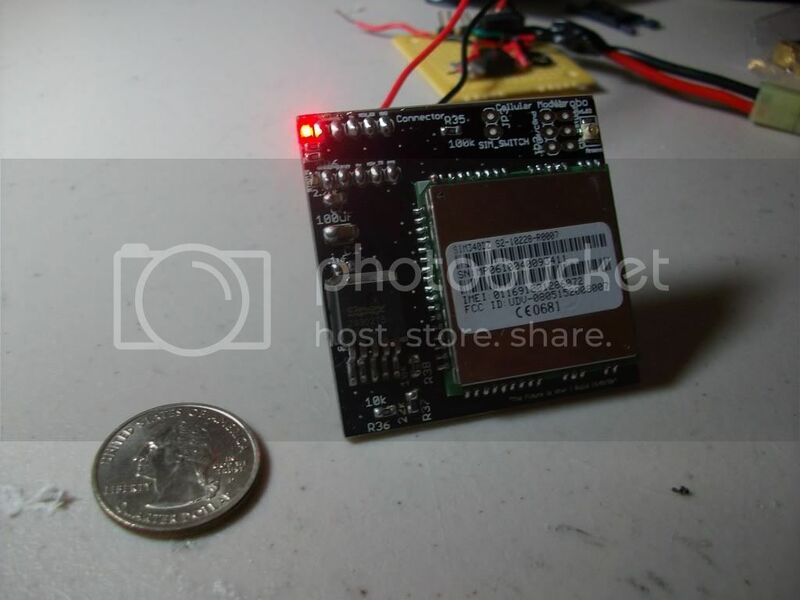 It has a simple UART interface that can easily connected to any 3.3V or 5V device, like most AVRs, PICs. All the necessary voltage level shifting is done onboard, so there isn't any headache. Connect it to your Arduino, your STAMP, your Gumstix board, your Axon, your whatever. It is completely breadboard compatible, so its perfect for any prototyping rig. Plus it comes with two neat little LED indication lights, so you can visually see and understand whats happening. Additionally, there are several pins that give you extra functionality. Imagine sending a text message to your custom circuit which starts your car. Or sending data wirelessly over the Internet to your UAV that flying over Afghanistan. Or getting GPS and weather data from your high altitude air balloon. All this is possible with DroneCell! I'm sorry for all the delays. I had a batch of DroneCells that required external SIM card holders. After conferring with some friends in the industry, I've made the decision to release a new version of the DroneCell, a version that has a built-in card holder. This obviously has resulted in some delay, so expect the final release in stores to happen within the next three weeks. 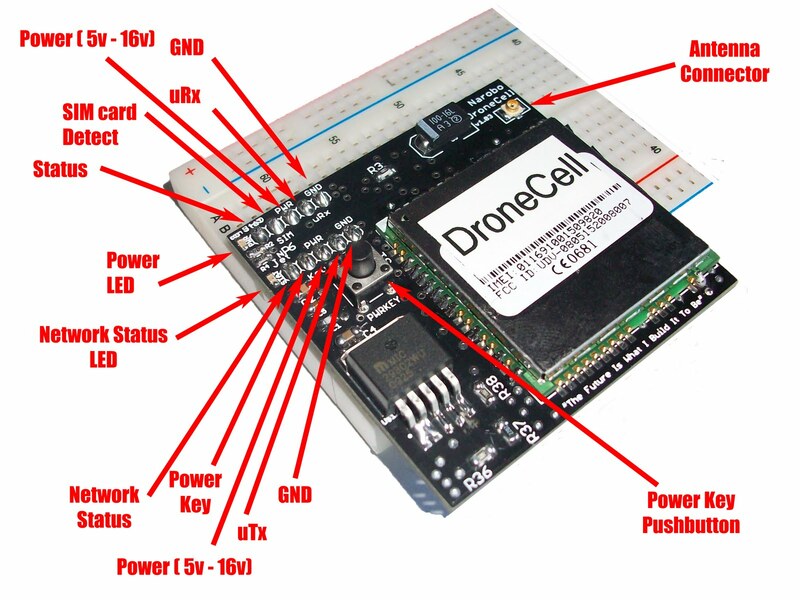 As of now, DIYdrones will be stocking the DroneCells, as well as one more electronic hacker oriented store. Pretty much everything else is the same, so all coding samples I have will work exactly the same way. Final price on these babies will probably be close to $100 retail. I'll have some more posts as they become available. I'm also considering some sort of preordering thing set up, because the demand for this has been higher than I expected, and we may run out of DroneCells from the first batch. I'm working on a documentary on high school BattleBots. I've been following multiple teams around since August, leading up to the National Championship. I'm trying to raise funds to film the championship with a multi camera crew, as well as travel to San Francisco to interview the BattleBot creators and builders. If you would be able to post something about this, it would greatly help me reach my goal and make this the best film it can be. Plus it'll raise awareness of the film at the production stage, so people can be involved in how the film turns out. I think its great that there is more awareness with regards to robotics, especially high school level robotics competitions. If you have a couple extra bucks to spare, you should consider donating some to his worthy cause. You even get cool promo items like T-shirts and the like. Announcing my new product... drum roll please..... DroneCell! It has a simple 3.3V to 5V UART interface, so it can be easily connected to any 3.3V or 5V device, like most AVRs, PICs. All the necessary voltage level shifting is done onboard, so there isn't any headache. Connect it to your Arduino, your STAMP, your Gumstix board, your Axon, your whatever. Videos and software to be uploaded this weekend and next week. I'll post up the new info as its available.